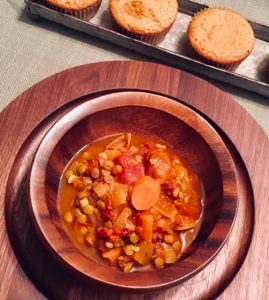 Lift your spirits and satisfy your cravings with this comforting, healthy stewed dish of goodness! We all have those days, when we just need that comfort food to revive our spirits. Here is a healthy dish that does not sacrifice flavor for nutrition. You will satisfy your hunger cravings and rejuvenate your body with nutritious ingredients. *I highly recommend Starwest Botanicals Organic Curry Powder Spice Blend. NOTE: Fresh, organic spices bring out the best flavor in any dish. Sauté the onions and carrots in the olive oil over medium-high heat approximately 8-10 minutes, until the onions start to brown. Add the garlic and cook one more minute. Meanwhile, process the canned tomatoes (with the juice) in a food processor, just until coarsely chopped. Rinse the lentils and remove any stones. Add the curry, salt, pepper and thyme to the sautéed vegetables and stir to combine approximately one minute. You should begin to detect the rich aromatic smell of the spices and herb. Add the tomatoes, lentils and chicken broth to the sautéed vegetables. Raise the heat to a boil, then lower the heat and simmer covered for approximately 40 minutes. 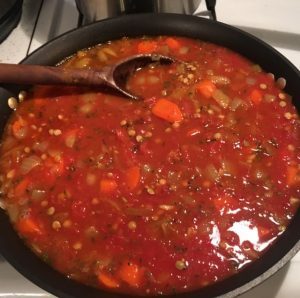 You want the lentils to be tender. Remove from heat and allow the dish to sit covered for 10 minutes. Then add the vinegar. We enjoy this dish with fresh baked almond flour muffins. Watch for the recipe!